The province of Livorno, traditionally called Leghorn in English, stretches along the coast, between Pisa and Grosseto, enclosed by the hills on one side and by the beautiful sea of the Etruscan coast on the other. Most of the lovely accommodations on the Etruscan coast are located in the well known villages of Castiglioncello, Marina di Cecina, Donoratico, Marina di Castagneto, San Vincenzo, as far as Follonica. The beaches, as well as the many resorts along the coast, are the main tourist attractions of this area, but one should not overlook the surrounding stunning and wild landscapes or the charming villages, such as Bolgheri, Sassetta or Suvereto, located just a few km from the coast, and where tourists can find many lovely and typical Tuscan holiday homes. The capital of the province is Livorno. Situated on the southern edge of the vast plain of the Arno River, Livorno was exposed to frequent raids from the sea and to the problems of a territory largely consisting of ponds and marshes. It was for a long time just a landing place. Archaeological investigations reveal the existence of a scant settlement near Castiglioncello, bringing to light an interesting necropolis. Between the 10th and the 11th century Livorno became a castrum and later a support structure to the nearby harbour of Pisa which encouraged people to move to the area through a policy of tax exemption. The progressive silting up of the bay into which the Arno flowed and on which Pisa's harbour was located as a port increased the development of Livorno. It was later bought by Florence in order to fulfil its desire for an outlet to the sea. The reconstruction of the defensive system and the building of the Fortezza Vecchia by Antonio da Sangallo the Elder in the early 16th century reveal the Florentine interest in Livorno. This continued under Cosimo I and his son who is considered the city’s founder. In fact, the ordinances issued by Ferdinando the 1st at the end of the 16th century, known as the Livornine Laws, set the city on a course of steady growth, giving the city a cosmopolitan and tolerant character; Turks, Jews, and Moors were given numerous concessions such as the freedom to profess their religion and follow their customs. Continuing the policy of privileges and tax exemption Ferdinando gave a special status to ethnic groups, traditionally discriminated. Alongside with people from England, Netherlands, Germany, Spain and Portugal, colonies of Armenians and Turks settled in Livorno and the Jewish community soon assumed a leading role. On the eve of the 19th century Livorno was described by foreigners as a city of modern appearance with wide streets and fine squares. The urban fabric was heavily damaged by bombing during World War II, nevertheless it is possible to find traces of its past in the picturesque quarter of Venezia Nuova, recently restored. One of the most important landmarks of Livorno is in Piazza Micheli, the monument dedicated to Ferdinando the 1st, better known as the Four Moors owing to the statues of four chained Berber pirates. The cosmopolitan distinctive trait is clearly reflected in the architecture. In the proximity of the Cathedral of San Francesco, the church of the Dutch and German congregation, the Greek Orthodox cemetery, the synagogue and the Armenian church bear witness of the freedom of religion, long enjoyed by the city. Give yourself a treat going on a cruise around the islands of the Tuscan Archipelago. There are ferries from Livorno to Gorgona, Capraia, Elba, Giannutri and Montecristo. They represent a world of light, an archaic world where the Mediterranean still seems intact, glorying in a light and colour that are still “Homeric”. 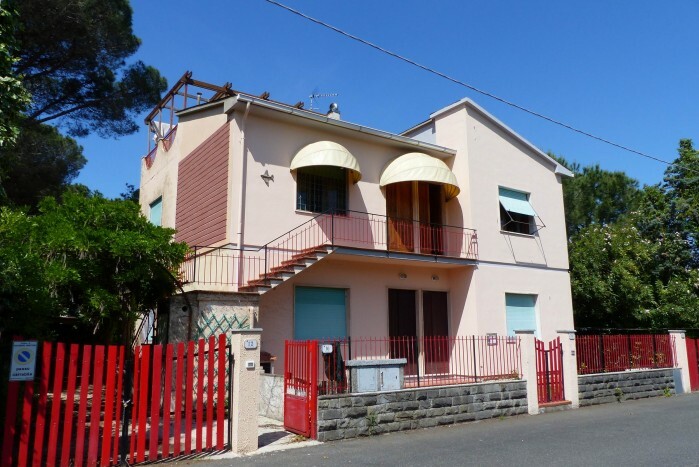 These holiday apartments on the Etruscan Coast are situated in a beautiful house near the lovely medieval hill town of Sassetta (only 800 mt away), at just 12 km from the beaches of Marina di Castagneto. Surrounded by a 2000 sq. m. park with chestnut grove, the villa consists of two flats (one on the ground floor and the other on the first floor), recently renovated with elegant furnishings. Guests have access to a garden with barbecue and wood-burning oven and a car park. Furthermore, down at Marina di Castagneto guests also have access to a private strip of beach with pinewood and botanic route: some facilities available such as dressing room, water, bathroom, deckchairs and sun umbrellas. These apartments for rent in Tuscany are ideal for enjoying a relaxing holiday but also in an excellent position for exploring the many medieval villages dotting the surroundings, among which Bolgheri renowned for its superb Sassicaia wine and the beautiful town of Massa Marittima, as well as archeological sites such as the ancient Etruscan necropolis of Populonia at just 25 km. 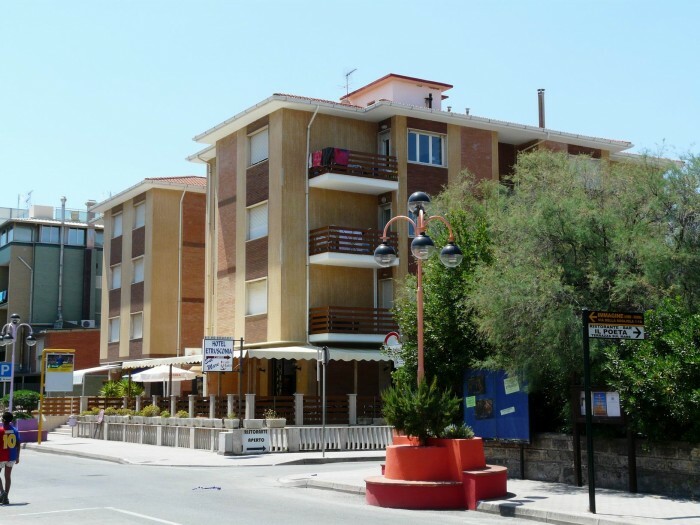 These holiday apartments in Tuscany are located in Marina di Castagneto Carducci, a beautiful village on the Etruscan coast, south of Livorno (Leghorn) and only 30 km north of Piombino from which one can catch ferries for the Isle of Elba. The accommodations are situated in a modern villa in the midst of a secular pinewood with nearly 1200 sqm of private, fenced garden and at about 300 meters from the sea. Arranged on two floors, the apartments are all well furnished. The ground floor has two apartments, both 50 sqm each, and on request can be communicating. Being built on a dune each apartment has a private garden. On the first floor there is a bigger apartment, 100 sqm, with a 50 sqm terrace. Also available barbecue and plenty of parking space. Guests also have at disposal a private strip of Maremma pinewood with botanic route and beach with some facilities such as dressing room, water, bathroom, deckchairs and sun umbrellas. In summertime one can enjoy evening walks to the village centre where the seaside promenade is full of people and interesting cultural events. Starting from these apartments for rent on the Etruscan Coast one can discover some of the many medieval Tuscan villages in the surroundings, such as Bolgheri, famous for the Sassicaia Wine, and Massa Marittima, or visit the ancient Etruscan necropolis of Populonia at 25 km. 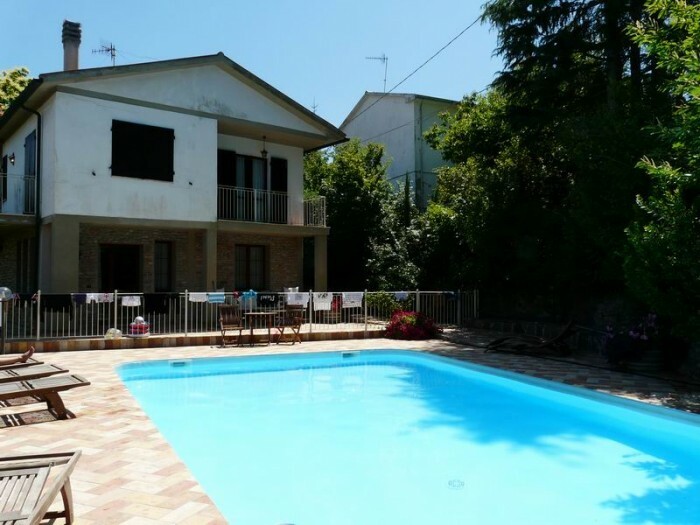 These holiday apartments in Tuscany are situated in a beautiful villa, ideal for a relaxing holiday, at 800 meters from Sassetta, a remarkable medieval village on the hills of the Etruscan coast at just 12 km from the beaches of Marina di Castagneto. 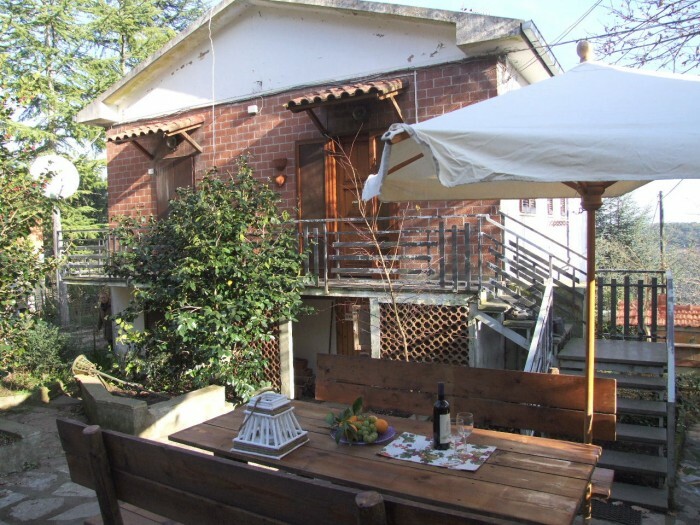 On top of a small hill, only 500 m above sea level, the accommodations are surrounded by a chestnut wood park of 2000 sqm. The villa consists of three apartments, recently renovated to a very high standard, in harmony with the surroundings. All apartments have a view on the “Pian delle Vigne” plains and the villages dotting the surrounding hills. Swimming pool on premises. These apartments for rent on the Etruscan Coast are in an excellent location for discovering some of the many medieval Tuscan villages in the surroundings, such as Bolgheri, famous for the Sassicaia Wine, and Massa Marittima, or for visiting the ancient Etruscan necropolis of Populonia at 25 km. In Marina di Castagneto our guests also have at disposal a private strip of Maremma pinewood with botanic route and beach with some facilities available such as dressing room, water, bathroom, deckchairs and sun umbrellas. 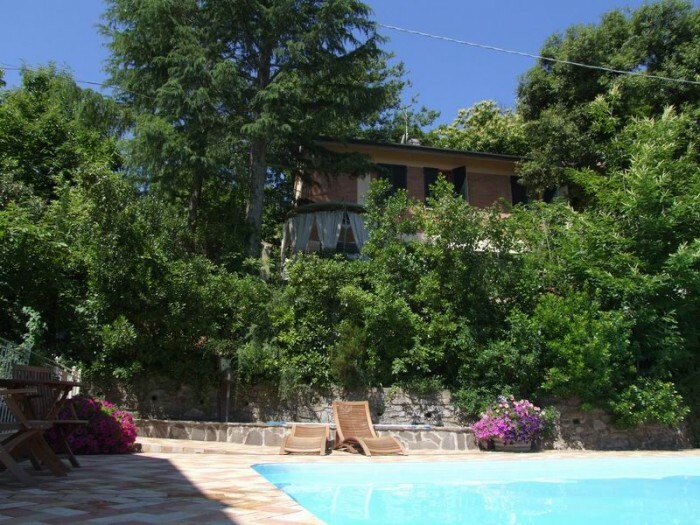 This bright and lovely holiday apartment is located on the Etruscan Coast in the tiny sea hamlet of La Mazzanta. It is just 4 km from the popular seaside towns of Marina di Cecina and Vada, and 15 km from the charming villages of Casale Marittimo an Montescudaio, as well as 20 km from Bolgheri and its wines and 45 km from the alabaster town of Volterra; Pisa is only at 55 km. In La Mazzanta the beaches are beautiful, at just 100 metres from the flat, and can be reached walking through a lovely pine grove which offers shade after sun-bathing all day long. The holiday accommodation is a large apartment on the first floor of a villa, with independent entrance and car park, and a gorgeous wisteria pergola perfect for alfresco dining. Entrance to the flat is straight into the living room. The sitting room is very spacious, with large arched windows, TV, fireplace, sofa bed for one person, dining area and kitchenette (equipped with oven, fridge, toaster, coffee machine). On the left from the entrance there are two double bedrooms and a bathroom fitted with open shower. Also available: single bed, hairdryer. A winding staircase leads from the sitting room to a solarium on the roof, perfect per relaxing or having breakfast. On the ground floor, under the pergola, there is a room with a washing machine, basin and toilet. Food shop and restaurants are within 120 metres. These holiday apartments on the Etruscan Coast are located in the beautiful town of Marina di Castagneto Carducci, south of Leghorn. The accommodations are situated on the 3rd and last floor of a building with lift right in front of the beach. The structure also includes a small shopping centre, a bar, a restaurant and a hotel. Guests also have at disposal a private strip of Maremma pinewood with botanic route and beach with some facilities available such as dressing room, water, bathroom, deckchairs and sun umbrellas. One can enjoy walks along the seaside promenade where interesting cultural events are often organized. For sea lovers this is the ideal spot also for cruises to the Island of Elba, with main port of departure at Piombino at only 30 km. It is also possible to visit the marvellous medieval villages of Bolgheri at 12km (famous for its Sassicaia wine) and Massa Marittima, as well as the ancient Etruscan necropolis Populonia (at 25 km). At guest's disposal private fenced car parking, internet wi fi, washing machine. 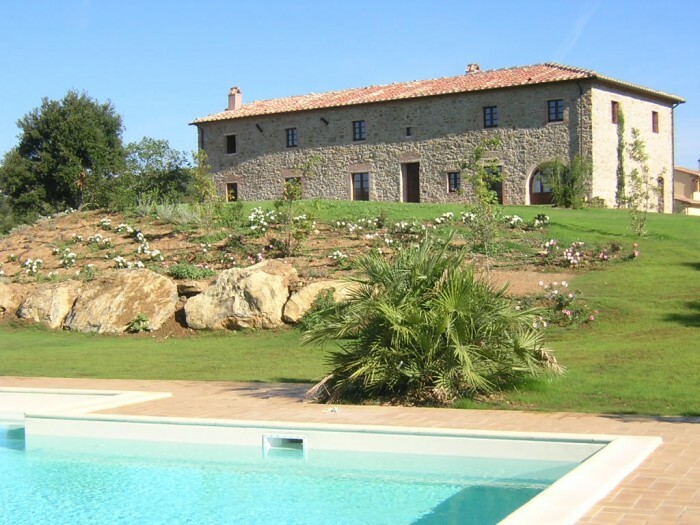 This totally renovated 18th century farmhouse is one of our best accommodations in Tuscany and is in the heart of the hills of the Etruscan Coast, near the village of Sassetta, at only 20 km from San Vincenzo and Donoratico. The villa preserves all the charm and enchantment of its past combined with modern comforts. Surrounded by a beautiful garden of nearly 3 hectares, this house for vacation rental is ideal for family reunions, weddings, meetings, workshops and cooking courses. The estate consists of the owner’s house, the main villa with 7 bedrooms (all double bedded except one which can be transformed) and two small cottages with two further bedrooms. The ground floor of the main villa has a long salon with a living room area (with TV and DVD player) at one end and at the other the dining area, a professionally equipped kitchen for cooking lessons and a washroom. There are also 2 bedrooms with independent entrance from the garden. On the first floor there are five bedrooms with en-suite bathrooms with shower and internet connection. Four bedrooms are accessed by a steep flight of stairs, whereas the fifth, the honeymoon suite, is reached from a sun terrace by an external staircase and has en-suite bathroom with Jacuzzi. Near the main villa are 2 independent outbuildings with a bedroom each and kitchenette so as to be independent apartments. This villa with pool on the Etruscan Coast is located at 800 m from the charming medieval, hillside village of Sassetta, just 12 km from the beaches of Marina di Castagneto and 17km from Bolgheri, famous for its Sassicaia wine. The holiday home is at 500 m above sea level and is surrounded by a secular forest with about 700 sq. m. of private fenced park. The house can accommodate 8 people, plus other 5 on request. The villa, 160 sq. m., is on two floors and consists of a fully equipped kitchen, a large living room with 2 very comfortable double divan beds, plus fireplace and Sat-TV, a dining room, a bathroom with washing machine and a veranda with barbecue on the ground floor. Stairs lead to the first floor where on the landing there are two divan beds, 3 double bedrooms (plus extra bed) with en-suite bathroom. Two double bedrooms share a balcony with a lovely view, whereas the landing has a French window leading out to a balcony overlooking the swimming pool. In the garden there is an outdoor shower next to the swimming pool (12x6, open middle May-Sept) which is shared with the other guest house on the property. At guest’s disposal Internet Wi-Fi, table tennis and barbecue. This holiday home in Tuscany is located in the lovely countryside of the Val di Cornia, offering many beautiful medieval villages to visit, such as Bolgheri and Massa Marittima, or the ancient Etruscan necropolis of Populonia at just 25 km.